The laughing buddha is traditionally associated with hospitality, food, beverages, and good luck in general. What better pairing than the succulent perfection of cured sausages and the savory beneficance of a treasured culture icon? 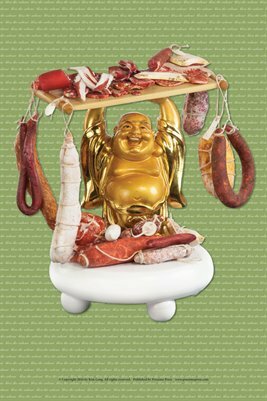 Our Salumi Buddha poster features the beaming presence of the laughing buddha surrounded by a rich selection of salumis ... modeled after products generated in the recently emerging trend of American-made cured sausages.